NASA is returning to the moon with a mix of potential firms to share the costs. “This time, when we go, no kidding, we’re going to go,” said the agency’s chief. With InSight now safely ensconced on Mars, NASA turned its attention back to the moon on Thursday, unveiling nine American companies now eligible to bid on delivering science and technology lunar payloads for NASA’s Moon to Mars Exploration Campaign under an aggressive timeline. These Commercial Lunar Payload Services contracts are initial steps toward continuous sustainable scientific study and human exploration on the moon, eventually Mars, and beyond. NASA intends the partnerships to enable regular shipments of instruments, experiments, and small payloads to the moon sooner and faster, cover more lunar regions, and maximize efficiency when humans eventually arrive. The eligible companies range from aerospace veterans to startups: Astrobotic Technology in Pittsburgh; Deep Space Systems in Littleton, Colorado; Draper in Cambridge, Massachusetts; Firefly Aerospace in Cedar Park, Texas; Intuitive Machines, in Houston; Lockheed Martin Space in Littleton; Masten Space Systems in Mojave, California; Moon Express in Cape Canaveral, Florida; and Orbit Beyond in Edison, New Jersey. High-profile firms Blue Origin, Boeing, Northrop Grumman, and SpaceX were noticeably absent, though NASA expects the list to expand in the future. The contracts call for indefinite deliveries and quantities with a combined maximum value of $2.6 billion over the next 10 years. NASA will consider competitive bids based on technical innovation, feasibility, price, and schedule, for missions as early as next year. (Proposals for instruments and technologies to study the moon are due in January.) They include payload integration and operations, and launching from Earth and landing on the moon. NASA expects to be one of many patrons using the services. “When we go to the moon, we want to be one of many customers in a robust marketplace between the Earth and moon with multiple providers competing in cost and innovation, so that we at NASA can do more than we’ve ever been able to do before and advance the humans species,” said NASA administrator Jim Bridenstine, who helmed the session with Zurbuchen at NASA headquarters in Washington, D.C. The companies will work in tandem with ongoing NASA lunar exploration. For example, its Lunar Reconnaissance Orbiter division wants to coordinate landing dates with commercial landers to observe their dust plumes to see how they disturb the environment. NASA might also reinstate instruments from the canceled Resource Prospector lunar mining mission. The initiative is part of Space Policy Directive 1, a year-old change in national space policy calling for a U.S.-led coalition of commercial and international partners enabling human expansion across the solar system by first returning humans to the moon, which offers a closer and, therefore, lower-risk proving ground to Mars. 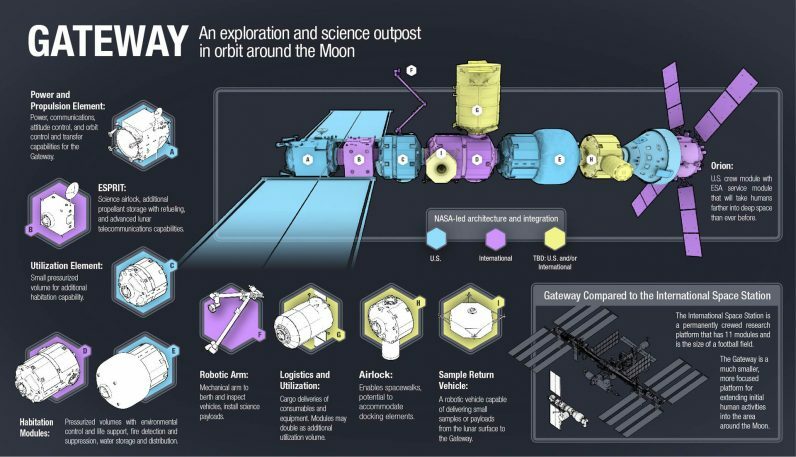 The plan includes turning over low-Earth orbit human spaceflight, such as the International Space Station (ISS), to commercial operation, establishing an orbiting command module called Gateway for long-term lunar orbit for humans, reusable landers making round-trips to the moon, and ongoing robotic surface exploration and building with lunar resources. NASA also expects to send an American crew around the moon in 2023. The NASA administrators fielded questions from reporters, Twitter users, and young STEM students–the ingenuousness of children’s questions contrasting the press’s pointed attempts to glean more details about the contract contents, vague selection criteria, and types of experiments. NASA Watch’s Keith Cowing noted the announcement echoed a similar one 15 years ago in the same room to return to the moon, without much progress since. “What seems to have changed is the color of carpet,” he said. By example, he cited a set of retro-reflector instruments, in partnership with Germany and Israel, as almost ready to go. 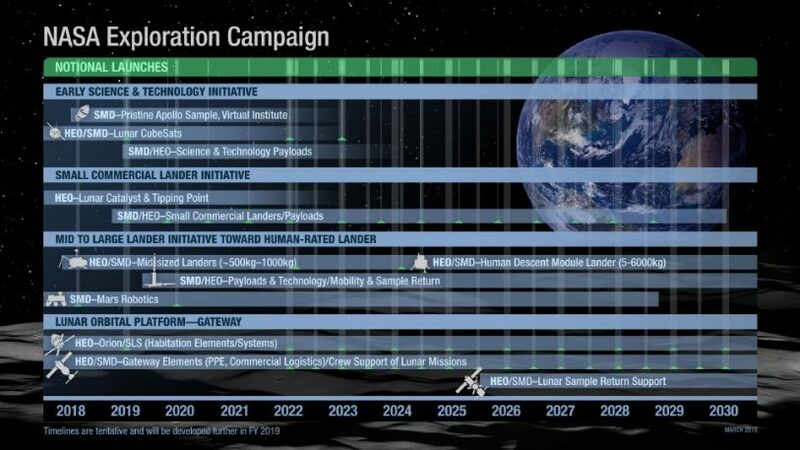 “We want to establish and open architecture capability—of data, communications, avionics, docking—to go from the Earth to the moon over and over again so any individual who can attract the capital, or company, could access it,” said Bridenstine. “We want to do it far more with commercial and international partners than we can do on our own. An open architecture builds sustainability. Think of it as venture capital. Our portfolio is larger, so we can take more risks and get it done fast.